Turning your staff into a social media army is surely not an easy thing to do. You have to tell your team your plan, encourage them to post messages daily on social media and most importantly trust them to do a great job. Though it is hard, it is surely not impossible if you know the right way to go about it. In this article, we will teach you 15 easy steps that will successfully help you convert your employees at work into a social media army. Keep reading the post to find out! For any kind of work, social media programs are something that need to be done more voluntarily. But if it comes to situations like this where you can try to improve the image of the brand, then you will have to come up with ways that will inspire them to want to become your personal social media assistants and helpers. If the employees are always enthusiastic and engaged about posting messages online, then half of your problems are taken care of but if that is not the case then you will probably have to make them want it and that itself is a huge task. Another thing you can successfully do in order to attract your employees and make them nuts about social media is by establishing a sphere that is absolutely professional. You should share messages that are relevant, speak to them about how fun social media is and how much it matters and how building a professional sphere can help. It is also important that all of your employees have some kind of a social following so that all the messages are being delivered to the right people. Of course all of your employees who are passionate about their work will be eagerly sharing the messages delivered by the company without you telling them how to do it. But having the right set of people to get it done is also important. This team should be responsible, should know how to display all messages in the right way and make your products and materials look good and relevant. Choosing people who can help your system improve and change is highly important and for that you will need people who can make great ambassadors. What we are trying to say is that the alignment of the audience is the key which not only works well but can also help the employees become a part of professionals that are relevant or even if its about developing personal networks on social media. Another thing you should remember is keeping the employee culture super strong! If employees are always happy with their working environment, then there are bigger chances the company would be put in a stronger and better light. This definitely works when you have established a certain routine in your workplace or just surprised the employees with something new and exciting. Imagine what it would be like to take them out on drinks on Wednesdays or give the best people free pizzas on Friday. You should always think of making things more fun and enjoyable. You should also encourage your employees to become more active on the social media channels. They should be using all channels such as Facebook, Instagram, Twitter, Pinterest and LinkedIn to stay updated and share company messages regularly. All of your employees must create a profile and stay active throughout the week. There are a few companies that do not allow their workers to be on social media because they believe it could be distraction. But if you have selected the right group of people who are serious about working and can help your company become stronger, then go ahead and put them on that spot! If you want your employees to represent and show off your brand to others online, you must let them know what your company and business is about. There are so many companies who don’t think it would be a good thing to share what’s on their mind. They don’t wish to share the company’s goals or missions with all employees but if it is about a social brand, you must do it immediately. There are five kinds of people who can be engaged employees. First of all, they have faith in the organisation, secondly they want to work to improve the working environment, are always willing to do more than required, are very respectful people and always help others and most importantly they understand the context and goals of your company. It is always a good thing to have brand ambassadors who are influential on the net but if you keep them outside the loop, then they wont feel like they are required to stay for long. If one of your tweets happen to go viral or in case there is a sudden boost in website trafficking, then you should always find the right source and praise the person who has made it happen. In that way, all of your employees will definitely feel more connected in helping the brand and spreading the message. Here are three quick and easy tips that can help anyone build a social media at work! If you want to start hiring for the current vacancies at your office, you don’t have to rely on the same old text based jobs. You can instead put your current employees on all social media networks. Ask them to add their camera interviews, their old experiences regarding the company. You must also encourage them to share all their cool and interesting posts on social media. What are the things they will love about the organization? What has helped them the most? You must also remind them that communicating with the workers can not only attract new people but also help the company grew. In that way, you will not just recruit new people but also build that social media better! If you don’t want your employees to post details regarding your company online, especially on their personal profiles, then a think file is what you really need. You have to ask them to put all their ideas and thoughts in a single file. You have to be able to host all your files in a Dropbox or even Google Drive. When the employees think of clever ideas or quickly brush through a story they would like to share, it would be actually be pretty easy if they upload it directly to the file. After that, one of the social media manager will be there to go through the ideas, sort them and come up with those that are promising on social media and other platforms. One of the most crucial steps you should always remember while trying to build your social media army is creating social media profiles just for your employees. You should inspire them to make use of the space they have so that they can discuss some of the current projects, make new conversation and also share all the important pieces of news between all departments. You must also remember all your employees that they are very much welcome to add more info to their public profiles as well. With so many customers, followers and people on social media, how can we know who we are speaking to? Whether it is your manager or director or even executives, you have to come up with ideas and work on your persona in such a way that your social media army can be built in a proper way. After all, we are sure you don’t want something that is week and feeble. A target persona in cases like these would be a great strategy. We made a sketch of a real person, added all his professional and personal details and all the work that he does, how he likes to spend time alone, kind of car that he likes to drive etc. We also shared all of this with the whole team so that they know who they have to reach! Though your employees are free to post the content of the company to their personal networks, you would still in some ways want them to think freely. They should have the liberty to share those ideas and thoughts they think that can help the company. Therefore, it would be wise if you create a social media content board where you can inspire your employees to add more interesting files, memes, links, questions, images and ideas of their choice. This will certainly turn out to be very helpful. If you want to build an army out of your staff for all social media activities, you have to let them be who they want to. Every employee should first have a good idea about the company and what you want to go for right now. You don’t have to let them know your long term goals but some of it has to be said so that they know what to put up. If you give them the freedom to speak their mind on social media, it will actually work way better than you expected! When people post genuine stuff about marketing language, others are automatically attracted. Not only that, people who are working for you feel better and comfortable working with you! There should be simple steps when it comes to sharing stuff on social media. 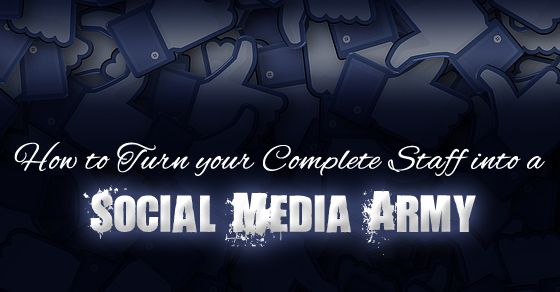 If you want to build a social media army, you have to make some things easy. All you have to do is use the Amazon click one approach on shopping. This will ensure you the best results. It will minimize the steps and make things much easy and effortless. Those who want to share messages which are suggested by the company are free to use this method. There is another method called pre drafting messages which is certainly helpful but often tends to give several logistical challenges. Ultimately you have to end up sending those suggestions to customers by mail. For that the employees will have to log in once again, copy and paste a message and then send it. With this, we would like to bring the post to a close. Have you enjoyed reading this article? What have you learnt from it? Have you tried some of these steps and techniques? If yes, please let us know in the comment box below. Also if you have interesting ideas in mind, feel free to drop a comment below. We are waiting to hear from you! But before we go, there is one thing we would like to tell. No matter which company you belong to, meeting new people and reaching out to others is hard and you will not be able to do them on your own. If you follow these amazing ideas, we promise you wont have to go elsewhere for help!